:People were made to create, but they don't always have the time or training to do it from scratch. Colors of Faith and Colors of Love not only provide them with creative inspiration, they also offer a fun and relaxing way to reduce stress and anxiety. The inspirational quotes and verses encourage colorists to reflect on themes of faith and love as they do what God designed them to do--create! Lisa Joy Samson's beautiful artwork varies in complexity to provide colorists with lots of variety, and the perforated pages make it easy to share the joy of coloring with others. 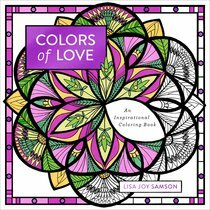 About "Colors of Love - An Inspirational Coloring Book (Adult Coloring Books Series)"
Lisa Joy Samson is the author of nearly forty books, including Quaker Summer, which was named novel of the year by both Women of Faith and Christianity Today. Her chief creative love has always been art, and she has designed book covers, invitations, and artful signage. She recently helped found 3Four Creative, an art-based company by women, for women, and with women, to encourage women to live centered, productive, and happy lives. Hailing from Baltimore, Maryland, she currently lives in Colorado Springs, Colorado, with her daughter.